Jennifer Todd. From LancasterOnline. Originally posted on June 26, 2016. Original article. 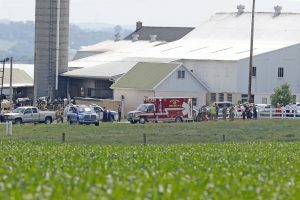 A 14-year-old boy was airlifted to an area hospital after being pulled from a pond at a Salisbury Township farm Sunday afternoon. Crews were dispatched to 5333 Peters Road, about two miles north of White Horse, at 2:13 p.m. for a reported drowning, according to White Horse Assistant Fire Chief Merv Fisher. He said initial reports indicated the boy was 9 years old. Fisher said the teen and a few other boys had been swimming in the pond when the boy went under three times. “He kept coming up but then going back down,” he added. Fisher said the boy was being pulled from the water when he arrived. He said the teen was not responsive and CPR efforts were started. The boy was flown by a medical helicopter to Nemours/Alfred I. duPont Hospital for Children in Wilmington, Delaware. Fisher said the boy “had a heartbeat” when the chopper took off but said the teen was not responding in any other way. He said the boy’s family also went to the hospital. “He’s a very sick boy,” Fisher said Sunday night, but declined further comment on the teen’s condition. The name of the boy wasn’t available Sunday. Fisher said he lives on Springville Road, which is a short distance from where the incident occurred.